They say getting there is half the fun, but sometimes getting there can be nerve racking. Take in point that you have to drive about four hours, all the while checking for the times of the ferry service. We were driving up one day before the ferry service starts running every half hour, so if we missed the ferry, we would have to wait an hour, and then wonder how long before our luggage got to our room to change for dinner. We were going to spend a couple of days on Mackinac Island for a board meeting, and while the ambience of the island is slow, sometimes you still are racing against the clock. I have written often about Mackinac Island and the serene idyllic lifestyle that awaits a vacationer, but some of the things that we take for granted here, are not the case there. There are no automobiles, save an ambulance and a fire truck, if you want a taxi, there are plenty of horse-drawn carriages ready to transport you around, or you may use a bicycle, or the most popular mode of transportation there is walking. That explains the urgency and haste in getting to the ferry service, because there is a time lag, as your luggage is transported to the hotel, so that one can get ready for dinner. The first night’s reception was a cocktail party at the Jockey Club, which is located across the road from the Grand Hotel and situated off the first tee of the Jewel golf course. The Grand Hotel is one of the few charming institutions that still require gentlemen to have a coat and tie for dinner, and no denim is allowed in the dining room. The Jockey Club is one of a couple restaurants owned by the hotel, that has a more casual rule about attire for dinner, but we dressed for the reception, because we were not sure if we would end up at the Grand for dinner afterwards. I know of one gentleman that went for dinner there that evening and he was given a tie to put on, and if he forgot to return it after dinner the hotel would just bill him for it; he told me that he only saw one other person with the same time and it was a young child. The reception area for the group was out on the patio in front of the restaurant and there was a fine array of finger foods and appetizers. Even though I live in Michigan and one sees smoked whitefish all the time, I and everyone else there all marveled at the quality of the fish that was being served along with the staple and required sides for it. The appetizers were so wonderful, with enough choices, that I am sure that some people had their dinner at the reception, though we and some others there were already making our plans for dinner. Directly across the patio from the food one found the beverage station, and the selection there was just as grand. There were several choices for soft drinks, several choices of beer, a fine selection of liquor and a choice of four different bottles of wine. There was also a fine group of bartenders there to take care of your selection. 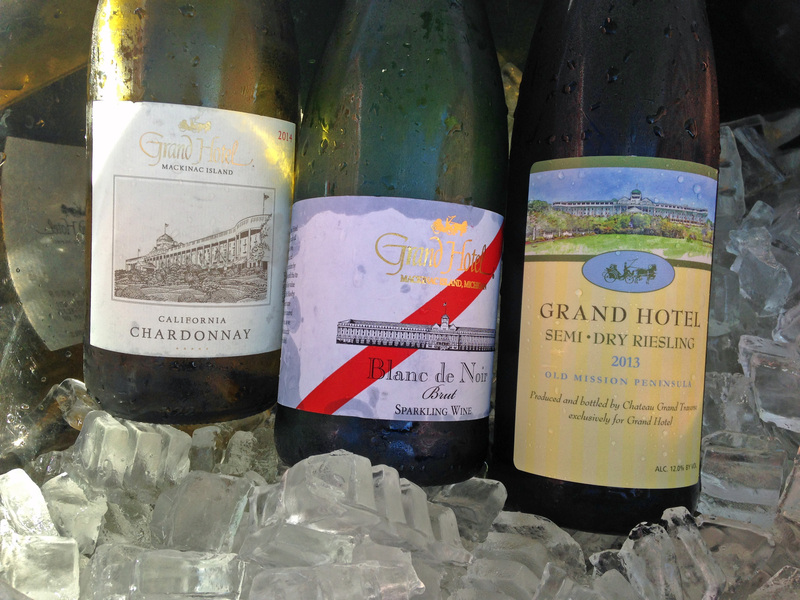 There were three wines in a larger icer all carrying the Grand Hotel label. The three wines in the icer were Grand Hotel California Chardonnay 2014 by Trinchero Winery, Grand Hotel Blanc de Noir Sparkling Wine NV by L. Mawby Winery in the Leelanau Peninsula of Michigan, Grand Hotel Semi-Dry Riesling by Chateau Grand Traverse in Old Mission Peninsula of Michigan. 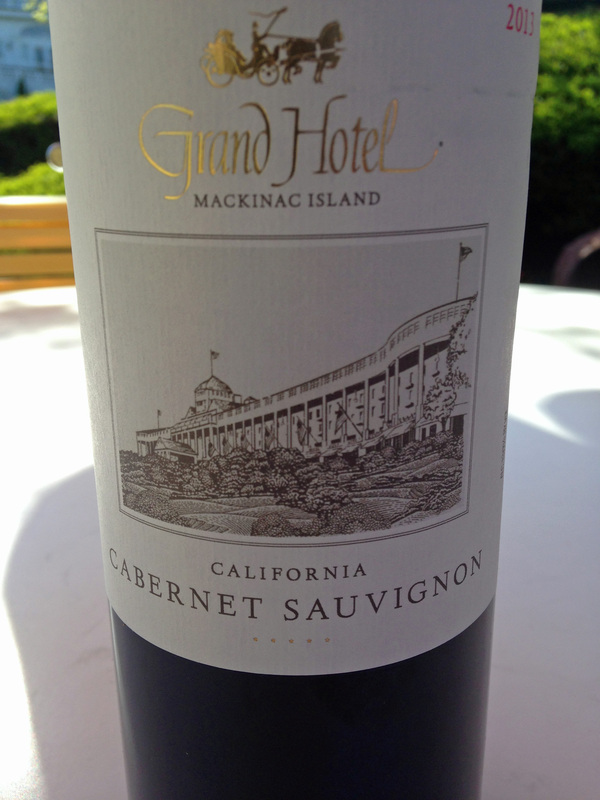 The red wine was Grand Hotel California Cabernet Sauvignon 2013 also made by Trinchero Winery. My Bride started out with a glass of the Chardonnay, but when she saw my flute of the sparkling wine and I told her it was by Larry Mawby, she got very excited and went and got a glass of it as well. After all of the rushing to get to the island, the reception was the perfect way to unwind and get used to the rhythm of the island. This entry was posted in Dining, Wine and tagged Blanc de Noir, Cabernet Sauvignon, California, Chardonnay, Chateau Grand Traverse, Grand Hotel, L. Mawby Wines, Leelanau Peninsula, Old Mission Peninsula, Riesling, Trinchero Family Estates. Bookmark the permalink. Sounds like quite an enjoyable place to relax, hope you enjoyed your time there.